We’re closing out this week of book reviews with a spectrum of titles, including one that I adored, a few that I was on the fence about, and one that simply wasn’t for me. Let’s get to ’em! 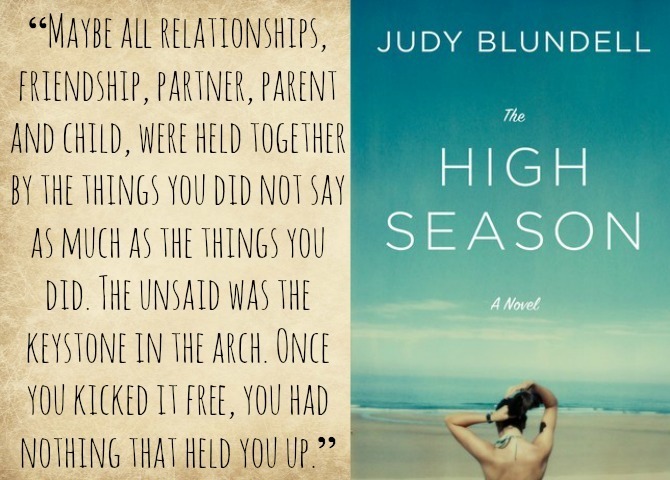 The High Season, by Judy Bluendell: Ruthie Beamish, her almost-ex-husband Mike, and their daughter Jem live in a lovely home in a resort town. Unfortunately, in order to afford the house, their family must rent it out every summer and relocate to a temporary summer home. This year, their lovely house is being occupied by a Adeline Clay, a wealthy and sophisticated widow who seems set on inhabiting more than just Ruthie’s home: soon she’s set her sights on Ruthie’s (ex)-husband, too, as well as her friends. Even Ruthie’s job as the director of a local art museum seems to be at stake. If this isn’t enough drama, High Season also tells the stories of Ruthie’s teenage daughter Jem (who is struggling to hang with the cool kids and is using the attentions of Adeline’s 22-year-old stepson as collateral); Ruthie’s employee Doe (a millennial with a knack for self-invention who wheedles her way into the life of a famous billionaire by taking up with his wayward daughter); and many other eccentric characters during one eventful summer by the sea. If this seems like a lot for one novel, it is; there are so many stories and characters that I struggled to keep up. It didn’t help that I didn’t feel invested in any of the characters other than Ruthie whose mid-life struggles with irrelevancy and regret intrigued me, even if they were somewhat overwrought. The novel’s pacing is good, with snappy dialogue, interesting social commentary, and great atmosphere, but ultimately this beach read wasn’t quite for me. 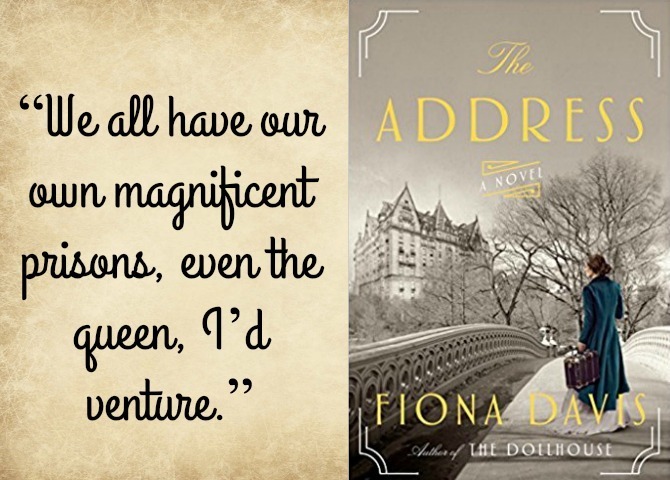 The Address, by Fiona Davis: London, 1884: At the age of thirty, Sarah Smythe has risen from a sullied past to become head housekeeper of a prominent hotel. Then she has a chance encounter with Theodore Camden, the architect of New York’s grand new apartment house, The Dakota. Soon Sarah finds herself on a boat to America, where she is to become The Dakota’s female manager. 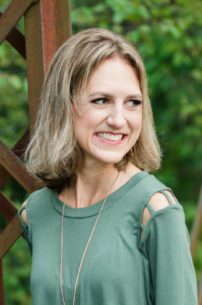 Soon after her arrival, Sarah’s relationship with her employer moves beyond the professional realm, and Sarah realizes she might be in over her head. One hundred years later, Bailey Camden has just come out of rehab and is out of work. Two generations ago, her grandfather had been the ward of Theodore Camden, but Bailey has no official claims to the family’s substantial estate. When Bailey (a designer) begins a renovation project at The Dakota, she makes some discoveries about her past, and uncovers a possible blood connection to the Camden family. As the novel progresses, we move back and forth in time from the initial story to Bailey’s sleuthing. It’s hard not to love a dual-timeline mystery revolving around family secrets. This is by far my favorite form of historical fiction, especially when the past and present stories are equally intriguing, as these are. Though there are some odd twists and revelations that felt more than a little contrived, I did enjoy watching the mystery unfold—almost as much as I loved learning about historical New York city and the fascinating Dakota building. I couldn’t quite put my finger on why the book wasn’t as engaging as I hoped it would be, and decided that the atmosphere felt a little stale: given the book’s rich setting, I would have liked more sensory details and a stronger sense of place. I also wished I had felt a stronger affinity for the protagonists, whom I found unsympathetic and mostly unlikable. This is a fun and easy read, but not quite the engrossing literary experience I was hoping for. 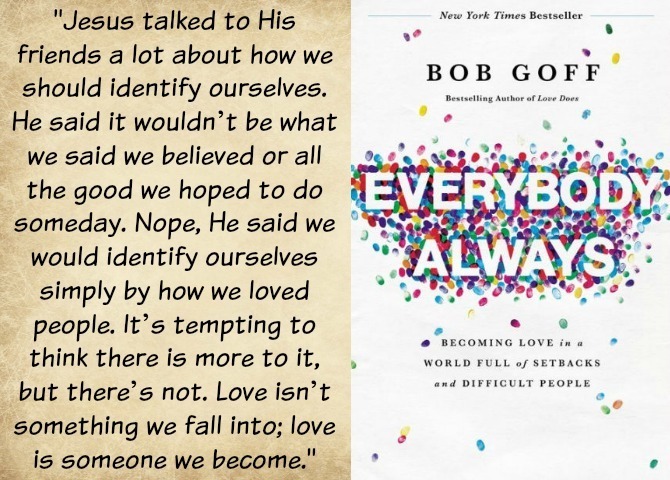 Everybody Always, by Bob Goff: Bob Goff completely swept me off my feet when I read Love Does three years ago; I was captivated by this eccentric man and his wholehearted dedication to loving God through loving others. I honestly felt like Bob might be too good to be true, but I’ve followed him closely in the last couple of years and have become a believer. It seems as though everyone knows Bob, and everyone loves him—and more importantly, Bob loves everyone! He doesn’t distinguish between Christians and non-Christians, good people and bad people, normal and abnormal. He simply loves on all people, because that what God has told him to do. (He’s told us to do it, too, but I don’t know that any of us is succeeding at Bob’s level—I know I’m not even close). Loving people doesn’t always come easily to Bob, but he does it anyway; and to Bob, loving people doesn’t mean evangelizing them. It means BEING Jesus to them, and leaving the rest of the work up to the Holy Spirit. Everybody Always is very much a continuation of Love Does, but in the best possible way. Bob shares completely outlandish stories of the ways he’s loved on people, and the lessons he’s learned in the process. Bob’s writing is hilarious and heartwarming, and I loved seeing the creative ways he’s loved on others, from an airport security guard to prison inmates, to African medicine men (seriously! ), to a neighbor struggling with cancer, and even his own wife. Bob is not at all prideful about his endeavors and it’s obvious that he truly feels blessed and excited to serve God through serving people. This book is infused with stories about Jesus, but Bob doesn’t include any direct scriptural references. I heard Bob state on a podcast that this is very intentional: he wants this book to be accessible to everyone, including people who are not well-versed in the Bible. He doesn’t want someone to be intimidated by lots of numbers that they won’t understand; in other words, even the style of his writing is a form of loving people who are often excluded by Christians. Everybody Always might be my most-highlighted book to date, every single page includes fantastic insights that I literally wish I could download to my brain. But more than any of these life lessons, what I will remember from this book is Bob Goff’s amazing example of how to love everybody, always. 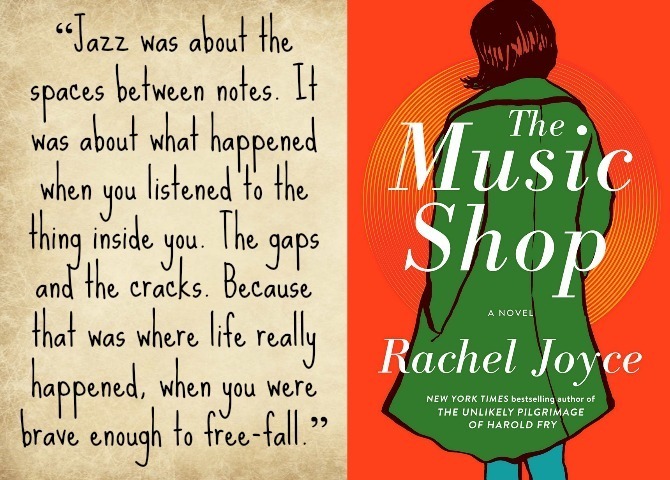 The Music Shop, by Rachel Joyce: In 1988, in a rundown London suburb, a middle-aged man named Frank runs a small music shop packed with his cherished vinyl records. The shop has a way of attracting the most bedraggled visitors, and Frank has a knack for matching each one with the perfect piece of music. One day, a beautiful woman named Ilsa enters the shop. To Frank’s amazement, she isn’t accompanied by the melodies he hears from most of his patrons; she is silent, and yet Frank is smitten. Though his feelings terrify him, Frank agrees to the compelling woman’s request for music lessons. As their friendship develops, we learn of the traumatic past that haunts Frank, particularly his fraught relationship with an eccentric mother. But Ilse’s story stays hidden, and it remains to be seen whether Ilse and Frank can overcome past baggage to begin to write their own song. This book has a lot going for it: quirky but endearing characters; atmospheric writing; strong themes of healing, friendship, and community; and of course some wonderful musical descriptions. Frank’s musical mind is fascinating, and his dedication to his shop and to his beloved vinyl is admirable and incredibly heartwarming. The writing is whimsical and sentimental, but not overly sappy. Based on its description and its merits, this book seems like it would have been the perfect fit for me. In fact, if I didn’t know better, it’s a title I would recommend to myself! Strangely, it wasn’t a favorite. For some reason, I couldn’t connect to the story until the last third of the book; the ending is great, but not quite strong enough to rescue the rest of the novel. I have a feeling I would like this more upon a reread, and I believe it would make a great movie. 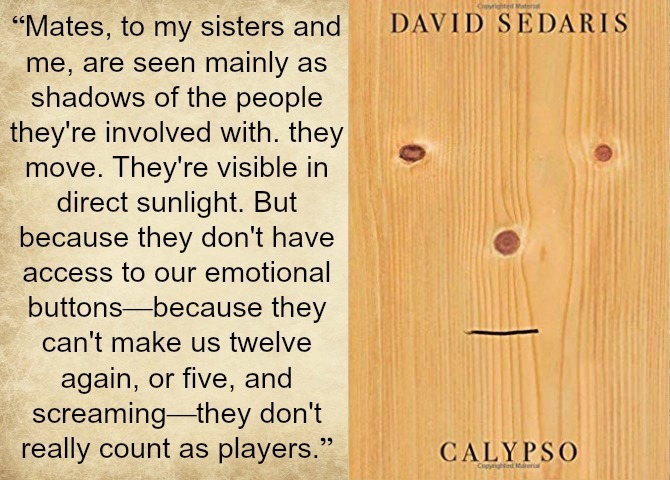 Calypso, by David Sedaris: I love the Publisher’s description of this book: “beach reading for people who detest beaches, required reading for those who loathe small talk and love a good tumor joke.” I’ve been a fan of David Sedaris for years, having heard his essays read on This American Life and countless other podcasts. His style is unlike anything else I’ve read: darkly humorous, self-deprecating, insightful and culturally astute. Calypso is the first full work I’ve read from Sedaris. No topic is too precious or too taboo for the author, and he covers everything from his sister’s suicide to octogenarians soiling themselves on airplanes. A number of his essays are truly outstanding, and I found myself cringing, crying, and laughing out loud within the span of a few minutes. Others were too vulgar or politically charged for me to fully appreciate. His honest observations on tougher issues, such as mortality and his personal neuroses, are the ones that stood out to me the most. I also could not stop marveling at his impeccable sense of comedic timing. I listened to the audio, which I definitely recommend. The book includes recordings of a few live readings, which were uproariously funny. I’d love to see Sedaris perform live, but this audiobook was the next best thing. Tin Man, by Sarah Winman: I’ll admit it, I chose this book for its cover. It was just too pretty to pass up! The premise intrigued me as well. It’s the story of Ellis and Michael, childhood friends who eventually become involved romantically. After a short-lived fling, Ellis marries a woman named Annie and Michael ceases to be part of his life. Fast forward a couple of decades and Ellis is living alone, grieving the death of his wife and trying to make peace with all that has occurred in the years since he and Michael were close. This is a story told through multiple perspectives, along a fluid timeline. There is so much fluidity that I nearly lost the story amidst the scene changes; in fact I had to listen through the whole book twice (it’s quite short) to fully grasp all that takes place. And I’ll admit that the love story between Ellis and Michael wasn’t really for me; the open-door bedroom scenes were especially uncomfortable. The book does have some wonderful moments, though. Winman’s writing is literary and lovely, with beautiful poetic imagery woven through the sparse prose. 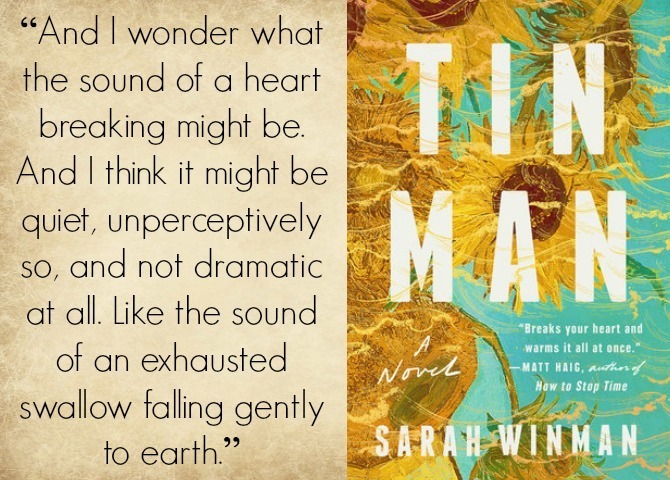 For a slim novel, Tin Man carries a great deal of emotion, speaking into themes of grief, friendship, identity, and survival. There ate some especially poignant messages about the importance of vulnerability and tackling the awkward parts of relationships before it is too late. The end brought me to tears and left me feeling more than a little wrung out. 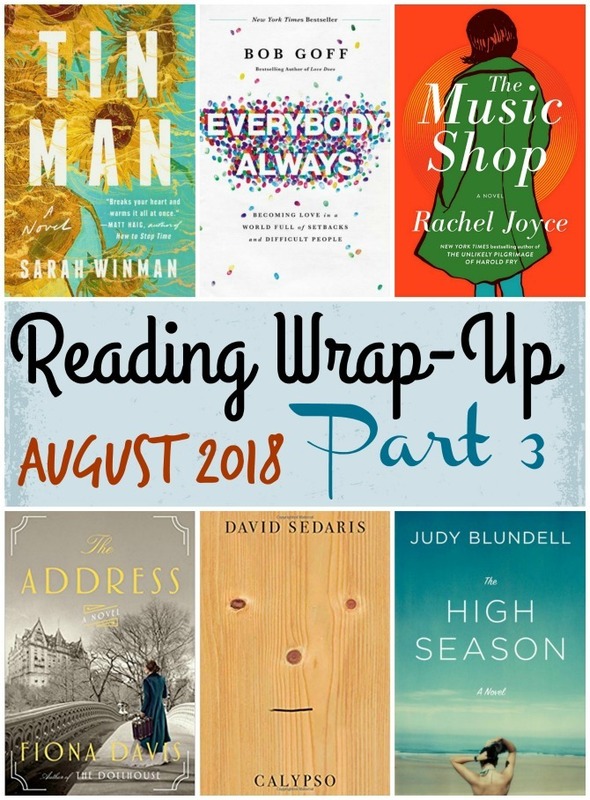 That’s a wrap for August book reviews. What have you been reading lately?